I’ve been experimenting with various web runtimes for running the system chrome of Webian Shell. Previously Webian Shell has used used XULRunner, Mozilla Chromeless and B2G from Mozilla, but all of these projects have now been discontinued. Gecko is no longer seen as a platform for building applications, just the back end of Firefox. This means it’s very difficult these days to build anything except Firefox with Gecko. During the transition of B2G to the community I thought it would be possible for me to continue using B2G OS as a base, using the new simplified architecture we had created with a split between system chrome and system web services. Unfortunately all B2G code is now being ripped out of Gecko so that isn’t an option. Positron was meant to be an Electron-compatible app runtime for creating desktop apps based on Gecko. This would have been ideal for the desktop version of Shell, but unfortunately that project has also now been discontinued. 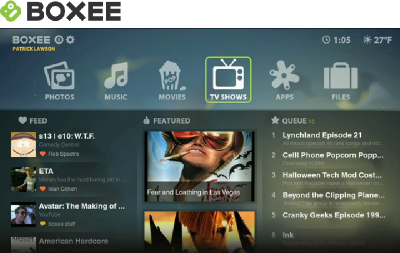 On the mobile side, GeckoView is meant to be a Gecko-based alternative to Android’s WebView. I experimented with creating a tablet version of Shell using GeckoView as part of an Android app. My idea was to use Android Things to boot to Shell as the only Android app running on a tablet device. The downside of Electron is that it’s not really designed for writing browser applications. The Tofino team discovered some limitations when trying to prototype new desktop browser experiences. Some of these limitations aren’t so much of a problem for Shell, but it seems likely that at some point I’m going to come across a missing feature. One example of a feature which Gecko has which Electron lacks is an event to tell the <webview> embedder when a manifest link relation is detected in a web page. This is needed by Shell to detect and install web applications. I filed a feature request for this but in the meantime the community suggested a workaround by using a “preload script” which allows you to inject a privileged script into web pages which runs before the content is rendered. I don’t really like this approach but it does provide a route for me to polyfill over missing features. In terms of providing a route to booting an OS straight to Shell I discovered that resin.io has a template for booting Resin OS straight to an ElectronJS application. What’s particularly cool about this is that they have support for various IoT developer boards including the Raspberry Pi and apparently have support for touch events. 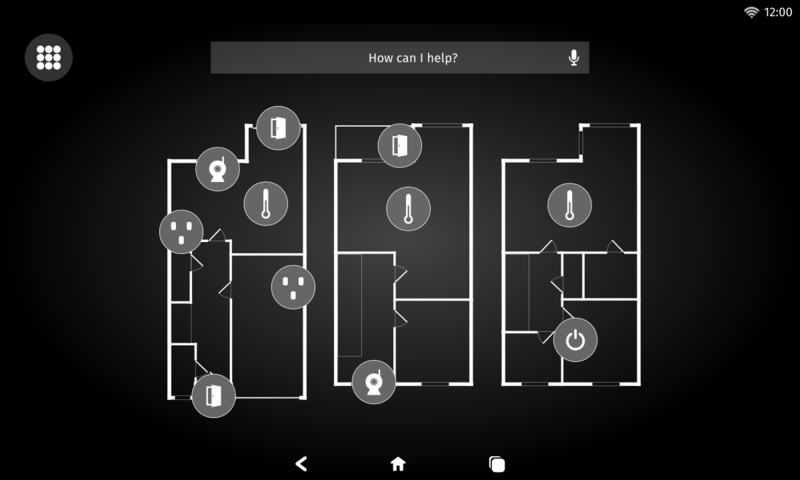 As I’ve been trying to prototype the tablet version of Shell using a Raspberry Pi with a touch screen (for use as a smart home controller), this could be ideal. It would allow me to write both the desktop and tablet versions of Shell using the same runtime and share code between them. The question is how well this performs in practice, which is going to require some more experimentation. As GeckoView is still quite immature I tried using the native Android WebView instead. This obviously works fine as an Android app, but I got stuck when I realised that Android Things on Raspberry Pi didn’t yet support WebView because it lacked OpenGL support. Trying to add a WebView to an Android app would just crash the app. Presumably this would also prevent me running a GeckoView based app on Android Things. This bug has just been fixed so it should be possible to use WebView in Preview 5 of Android Things. But it would still mean a completely separate code base for the tablet version of Shell and I’m not sure the native Android WebView has all the features I need. The “Quantum Browser Runtime” rose from the ashes of Positron with a less ambitious goal of providing a desktop application runtime using Firefox and existing Gecko APIs, rather than trying to be compatible with Electron. The downside is that because Gecko is so tightly coupled with Firefox these days, qbrt includes a bit too much of Firefox in its current incarnation. This makes for a bulky download and weird issues like my application calling home to Mozilla for things because it thinks it’s still Firefox. These things may well be fixed over time, but qbrt still feels like a side project and I don’t have confidence that it’s going to stick around very long. Technically Firefox is still using B2G’s Browser API which I need to create Shell and there is a vague plan to move Firefox from XUL to HTML over time, so my needs should be fairly in line with the long term plans for Firefox. But this plan is slow moving and while the “platform” team (now the Firefox back end team) is laser focused on the current needs of Firefox, anything that gets in their way gets ripped out of Gecko. For example, methods on the Browser API which were used by B2G to set the visibility of browser tabs to prioritise processes were removed without notice to make way for a new process priority manager in Firefox. I really want to use Gecko for Webian Shell, but I’m finding the Firefox team are quite hostile to anyone except the Firefox team using Gecko to build things and it’s getting harder and harder to do so. I haven’t yet come across any of the limitations of Electron that Muon is designed to fix, but I imagine that eventually I will. Also, I understand that the Kai OS team is using Muon to try to replace Gecko on B2G by porting Blink and Muon to the Gonk OS layer (basically the lower layers of Android). If they made that open source it would mean that there could be a path to running Muon-based applications on Android hardware in the future, which is quite exciting. Electron has some limitations when it comes to building a browser and I’m not sure how well it will perform on touch based hardware compared with say a native Android app running on Android Things, and there’s currently no easy way to get it running on Android tablet hardware. Also, it would mean leaving behind Gecko which Webian Shell has been using from the start. In an attempt to hedge my bets I’ve been trying to write a common layer of abstraction on top of both Electron’s <webview> and qbrt’s <iframe mozbrowser> HTML elements by creating a <webian-webview> web component with my own WebView API. This would allow me to support both Electron and qbrt with the same front end chrome code. This in itself was not easy because Gecko still doesn’t support Custom Elements or the Shadow DOM. I was able to achieve it using the webcomponents.js polyfill, although there’s a bug with that library which prevents my current implementation of the chrome from running in Gecko. I also created a startup script which can detect whether it’s running in Electron or qbrt and follow the correct code path accordingly. Whilst I like the flexibility of being able to run on both Gecko and Blink, this adds an extra layer of abstraction which will probably hurt performance in the long term and may get quite complicated as I get into more advanced features which are significantly different or simply missing from qbrt or Electron. I think my overall conclusion is to start with Electron. Electron is well supported, comes pretty close to what I need and it provides an easy path to migrate to Muon and/or a potential KaiOS runtime in future. If Spidernode goes anywhere and Mozilla puts some real commitment behind a Gecko app runtime then I could potentially migrate back to Gecko in future, but for now it’s just too damn hard to use. The Electron approach might not work so well for touch-based devices if the Kai OS runtime doesn’t get open sourced as I suspect performance on Resin OS isn’t going to be great and I’ll have to implement my own on-screen keyboard which I’d probably get for free with Android Things. So I may keep experimenting with a native Android version or even using React and compiling to different platforms. I recently wrote about The Story of Firefox OS, which ends with Mozilla no longer continuing their work on the Boot to Gecko project. Having worked on the concept of a web oriented OS for over a decade now, I have no intention of stopping just because Mozilla has lost interest. I intend to continue hacking on Webian when I can. In February I gave the Webian website a bit of a refresh and updated it with my latest designs for Webian Shell (now including both a tablet and desktop UI) and Webian Home (the home server part of Webian which I started earlier). 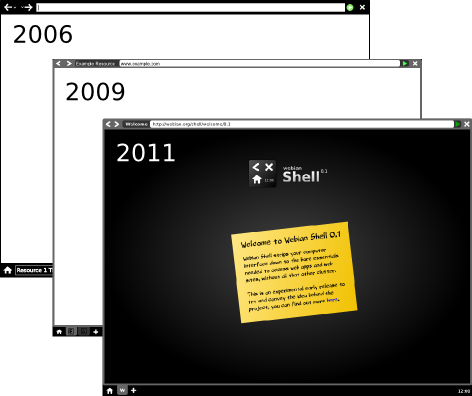 Webian Shell is a graphical shell for the web. Now that Mozilla Chromeless, XULRunner, mozApps and B2G have all been stopped, it’s incredibly difficult to use Gecko for anything other than building Firefox. The Positron and GeckoView projects hold some promise of Gecko being embeddable again in the future (on desktop and mobile respectively), but in the meantime I have to consider the possibility of using something else for Webian Shell. One possibility I’m considering for the tablet version is re-writing the UI shown above as a full screen Android app using Android’s WebView, which could eventually be used as a stand-alone front end running on top of Android Things. On the desktop side I’m considering using Electron, although the Tofino team has already discovered some of the limitations of that approach. When I get the chance I’ll try prototyping one of these approaches and see how far I get. 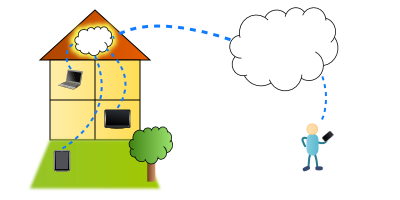 Webian Home is a web server for your home. 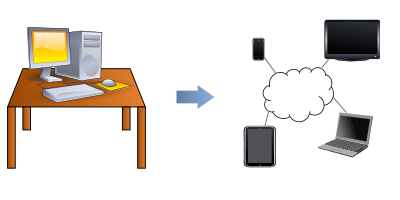 My work in Connected Devices at Mozilla has also re-kindled my interest in building a home web server. I have a broad vision for the use cases of a web server in the home (some examples below), but I hope that the work in my day job might contribute to the smart home aspect of that vision. 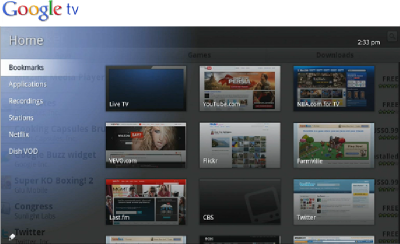 The best thing about web apps is that they can run on any platform. This is because they use a set of open standards which are universally supported. The latest incarnations of these standards like HTML5 and CSS3 are more powerful than ever and it seems inevitable to me that the web will eventually win out as the open, universal app platform. The current generation of popular desktop operating systems like Windows 7, OS X and Linux and mobile operating systems like iOS, Android and Windows Phone treat web apps as second class citizens, inferior to their native platform-specific counterparts. But that’s all set to change. Microsoft Windows 8, Google Chrome OS, The Linux Foundation’s Tizen and Mozilla B2G will all join Webian in putting web apps centre stage, as the preferred category of app on their respective platforms. Thanks to HTML5 and related standards web apps are already pretty powerful, but there is still some way to go before web apps can do everything that native apps can do. On mobile platforms new APIs are needed for access to telephony, messaging and cameras for example, and some kind of “app store” style distribution and installation mechanism is likely to be needed to provide a more app-like experience. “Installing” a web app is a little like bookmarking a web site and can provide an opportunity for the app to ask the user for all the permissions it needs up-front, download any resources which will be needed for offline use and perhaps add an shortcut icon to an app list. Because there aren’t currently established standards for all of these features, each platform is intially rolling its own approach. Apps for Chrome OS can only be found via Google’s own “Chrome Web Store“, you have to have a Google Account to install them and many of the apps found there will only work in Chrome. 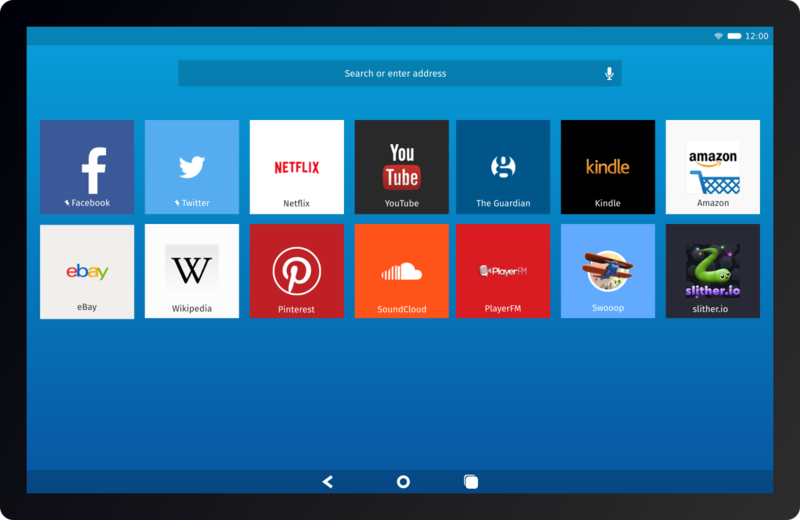 Windows 8 will have a set of APIs for its new Metro user interface, but apps written for Metro won’t necessarily work on other platforms. We don’t yet know much about Tizen, but previous mobile platforms like HP’s WebOS and the MeeGo Web Runtime have also had platform-specific APIs. Mozilla is also working on a new set of web APIs, but in line with their mission of promoting openness on the web they’re doing so in a more open way. You can see the progress of theirÂ APIs forÂ telephony,Â messaging (SMS),Â battery,Â visibility,Â settings,Â power management andÂ contacts on Bugzilla. These new APIs on Mozilla’s core platform are the first step towards a new mobile OS from Mozilla called B2G or “Boot to Gecko”. B2G will have a highly customisable UI built entirely with web technologies and will allow for the installation of Open Web Apps, as proposed by Mozilla Labs. With Open Web Apps, anyone can run their own app store or directory and the aim is to create cross-platform installable web apps. Mozilla is also collaborating with Google on “Web Activities” or “Web Intents” which could provide a standard mechanism for apps to call other apps for certain functions. This collaboration is a promising sign because Mozilla can not define standards on their own and will need to co-operate with other browser & OS vendors. There are already standardisation efforts in this area at the W3C such as the Device APIs Working Group and the Widget Packaging and XML Configuration recommendation, but W3C recommendations are not always in line with what the implementors (browser & OS vendors) are doing. For example, W3C Widgets provide a mechanism for installing a “widget” locally on a device by packaging up all of its resources in a zip file, including an XML manifest file. The specification was used for widgets in the Opera browser but when the MeeGo Web Runtime tried to use it as a method of installing fully fledged web apps it didn’t work out very well. Mozilla and Google are taking a different approach to installable web apps, both choosing to use a JSON manifest file and rely to a large extent on HTML5’s offline capabilities for caching and updating offline resources. Even these two similar implementations have subtle differences which make them incompatible with each other so there’s a real need for standardisation in this area if we’re to have cross-platform installable web apps. One slightly odd trend in the standardisation of “web apps” is the tendency to focus on “packaging” apps rather than “hosting” them. This seems to be an attempt to emulate the way mobile and desktop apps currently work by bundling up all of the app’s resource in a “package” which is downloaded and installed locally. The whole package then needs to be updated every time any of the resources change. This seems odd to me because this isn’t the way the web usually works and it doesn’t seem very web-like at all. The fact that an individual resource can be identified by a URI is what makes it a part of the web, so to package resources up in one big bundle to be downloaded and used locally seems to break the web paradigm and therefore these apps are not “web apps” in my view, just apps downloaded over the web. This is how W3C widgets work and it’s also how Chrome “packaged” apps work and seems to be the direction of the Wholesale Apps Community, the EU funded Webinos project and the Native Web Apps community on the W3C web site. It seems that web apps will be the preferred category of apps for a whole new generation of operating systems, but in order for these web apps to remain cross-platform new open standards must be agreed upon for APIs which give web apps all the power of native apps. A mechanism for the discovery, installation and updating of hosted installable web apps and a trust framework which allows for secure open distribution is also something which I think desperately needs standardisation if the vision of a universal open web app platform is to be realised. Webian Shell is a full screen web browser for devices that don’t need a desktop. As of today you can download a prototype which you can try for yourself. Update: Webian Shell featured by Mozilla Labs! If youâ€™re anything like me then youâ€™ll find that most of the stuff you do on your PC these days happens in a web browser and the desktop environment you used to depend on is now just getting in your way. Modern web applications can do just about everything traditional desktop applications can do (like flashy graphics, sound, video and offline storage) so often all you really need is the browser. The idea of the Webian Shell project is to replace your computerâ€™s interface with something much simpler, which treats web applications as first class citizens and does away with all the un-necessary clutter. This initial early release really just gives you a minimalist, full screen, tabbed web browser with a clock and a rather empty looking home screen. I hope this is enough to convey the basic idea behind the project and that with the open source community’s help we can quickly iterate this prototype to encompass lots of exciting ideas about what living on the web could really be like. These are some of my ideas for future directions to take the prototype, but Iâ€™d love to hear your ideas. Home screens – instead of a desktop, Shell could have multiple home screens like you see on mobile devices, but containing web widgets and icons for â€œinstalledâ€ web apps. See Mozillaâ€™s Open Web Apps project for some inspiration. Hardware controls – any graphical shell for a hardware device needs the ability to monitor and control hardware for things like sound, network, GPS, battery etc. Zoomable tiled window manager – zoom out to a view of all currently loaded web pages (like Panorama in Firefox or Expose in OS X), then zoom in to the page you want. On-screen keyboard – for touch-screen devices like tablets. You can find out more on the Webian web site or go straight ahead and download and install Webian Shell 0.1 on your Mac, Windows or Linux computer today. Iâ€™d really love to hear your feedback! You can propose ideas, report bugs and ask questions on GetSatisfaction, or join the Google Group to take part in the conversation. 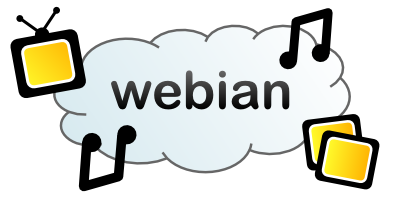 You can also follow Webian on Twitter or Identi.ca, like it on Facebook and check out the channel on YouTube. Hello, World! I’m Ben and I’d like to introduce you to the Webian project. You may have noticed that there’s a growing trend of web applications replacing desktop applications, a mass migration from the “desktop” to the “cloud”. Web applications are great because you can access them from anywhere, on any web-enabled device and their networked nature means they can be more connected and social than their desktop counterparts. Innovations in new devices like smartphones, tablets, netbooks and set-top boxes are providing us with exciting new ways of using the web, without needing to use a desktop PC. All of this innovation is building momentum around a new standard called HTML5 which is going to transform the web as we know it. Web applications of the future will be richer, more graphical, more interactive, will include high quality audio and video and may even work if you don’t have an Internet connection. In other words, they’ll have all the power of desktop applications but with all the benefits of the web. At home I have a collection of documents, images, audio and video measuring in the terabytes. No commercial service will currently host this amount of data online for me at a reasonable cost and even if it would, I’m not sure I’d want to use it. I like the idea of having full control over my own data and I can store it pretty cheaply myself. 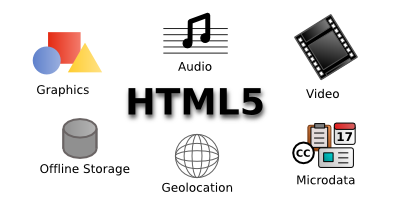 However, I would like to be able to access my data from anywhere on any device, and enjoy the kind of user experience provided by the new breed of HTML5 web applications. The great thing about the web is that it’s so open. 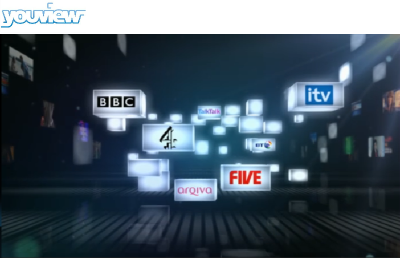 You don’t have to be a large corporation or pay a license fee to host a web server, anyone can do it themselves using free software and a domestic broadband connection. However, it does currently require quite a lot of technical know-how and there aren’t a huge number of useful web applications you can install yourself that the average web user might want to use. I’ve been running a Linux-based web server from my home since 2003 to allow me to access all of my data online, but really it’s little more than a glorified file server. I’m starting the Webian project to build an open source social media server for your home with a rich HTML5 web interface. 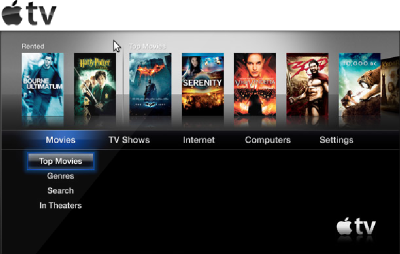 I want Webian to make it easy to access all of your media online from a range of devices like phones, tablets, netbooks and your TV. I can’t do this on my own. I need your help to design the best solution to this problem, make a great job of building it and then promote it so that everyone can benefit.Â If you share my vision, or you’re just interested in hosting your own data online, visitÂ webian.org today to learn more about this project and find out how you can participate.